Skincare for the modern man has never been more important than it is right now and I can honestly say I am late to the game. At the very young age of late twenties I suppose now would be the ideal time to start or to adjust the daily skincare regime. 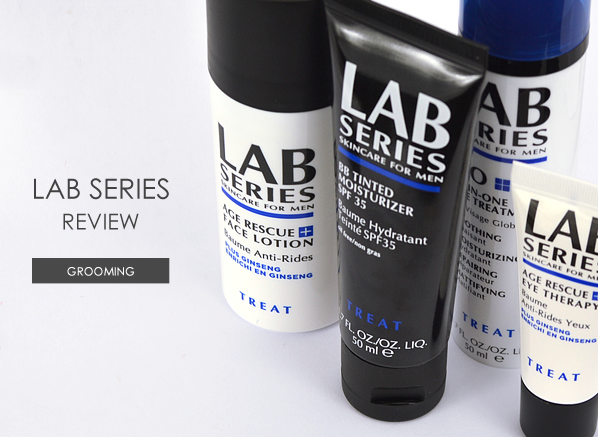 I jumped at the chance to review a few Lab Series products as I have heard great things on the grapevine without really knowing much about the brand. Lab Series Skincare For Men understands men’s unique skincare concerns, using formulas proven by scientific research to created the latest products in anti-ageing, shaving and moisturisers. They have created a Clean, Shave and Treat system for a great results based skincare brand. I have been given the opportunity to test four Treat based products which changed the way I faced each day and here are my findings. 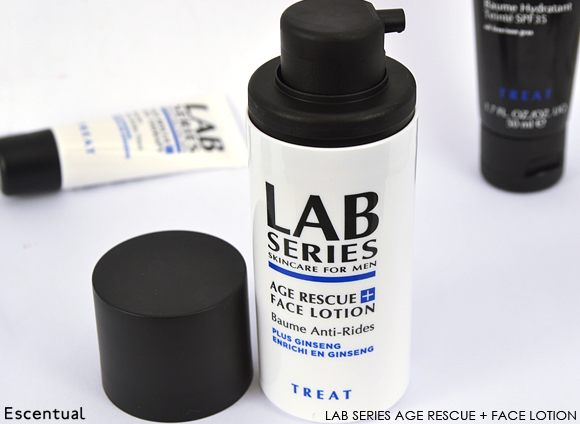 The Lab Series Age Rescue+ Face Lotion plus Ginseng is a daily age-fighting moisturiser which contains AO-10tm a complex of ten anti-oxidants that helps defend the skin from the signs of aging. The Lotion comes in a gel-lotion that can be easily applied to the skin after shaving as a daily moisturiser. My facial hair growing skills are not up to scratch so frequent shaving was not possible during the trial however as a morning and/or night-time moisturizer it really freshened up my skin and left it smooth to the touch. Even after shaving my skin still felt smooth and calm and soft to the touch. There is a slight fragrance on the lotion in hand but after working it into the skin disappears. Being a night owl and still not able to cope with early rises this really helps me look refreshed and ready for each day be it work, rest or play. 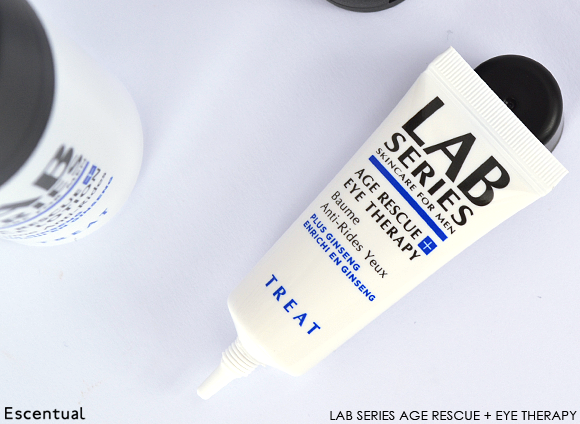 Lab Series Age Rescue+ Eye Therapy plus Ginseng is a real less is more product. The gel is to be applied to around the eye area morning and/or night and one thing I have learned is when applying like all eye creams is to work the cream/gel from in to out. I worked this around my eye socket every morning and the results were great. Although I don’t believe my eyes shows my age the skin around the eye feels moisturized and smoother to the touch and soft. The tiny amount of lines and wrinkles around my eyes appear to have been reduced in the amount of time I have been using this as part of my new skin regime and I can easily say this one is a keeper. 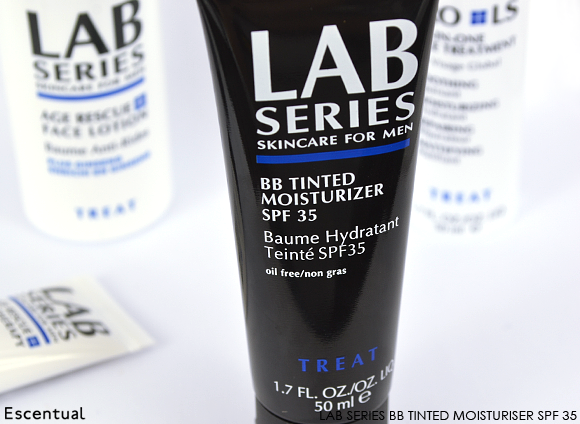 The Lab Series BB Tinted Moisturiser SPF35 was the product I was apprehensive about using. The thought of a tinted moisturiser did not appeal to me at all and brought back memories of theatrical make up from almost a decade ago. Having never tried any sort of tinted products I imagined how my friends would react to the fact that I was wearing “mens make up” with dread. The first morning I applied the cream I was apprehensive of how dark it looked and was worried it would really change the tone of my face. I needn’t have worried at all as it blended into my skin tone perfectly using its state-of-the-art Tagra technology. It really camouflaged the imperfections in my skin and left me with a immediate noticeable improvement and left my skin looking healthy and shine free. The moisturiser uses a 10-in1 formula that reduces pores, firms and tones the skin, helps with hydration shine control and reduces redness. With the added benefit of SPF35 helps guard the skin against those damaging UVA/UVB rays this really is a time saving essential that does everything. The only comments I have had is how great my skin looks. 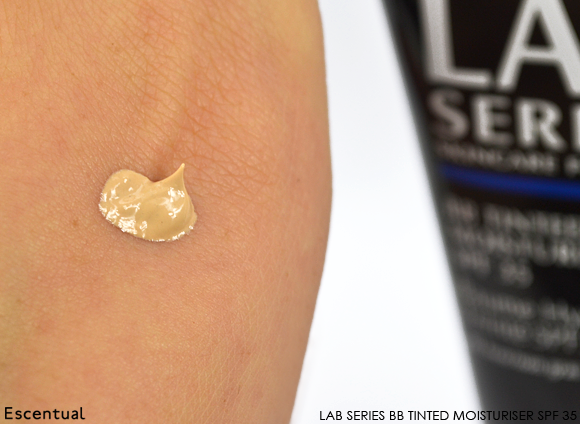 This really is skin confidence in a tube! 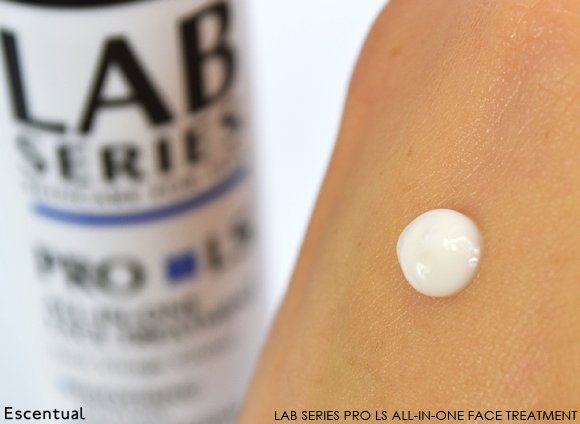 The Lab Series PRO LS All-In-One Face Treatment is the one and you’re done product for the man who requires simple, fast and effective skincare with little fuss. The gel-lotion is a little thicker than the Series Age Rescue+ Face Lotion but that’s not a negative. With this you can feel immediate action from this advanced post-shave lotion. It can be used as a daily moisturiser and offers four skin solutions in one proven formula. I am coming to the end of my not often used razor and this was superb at fighting razor burn and skin tightness after shaving. My skin felt instantly smooth and moisturized and with the added shine control and the look of lines and wrinkles minimised this really is the “One. And you’re done” product. Every morning I used this my skin felt smoother always looked refreshed even when I didn’t feel refreshed. This was the product I used after coming home from work before going out in the evenings just to refresh my skin if I was having a rough day. Three pumps of the gel-lotion easily covers the entire face and you can really feel it working on the skin as soon as you apply. I was surprised how quickly this absorbed into the skin and the formula allows this to be super light. Overall Lab Series has altered how I look at men’s skincare and has convinced me to get up that little bit earlier and look after myself better. Several of my friends who I haven’t told of this trial have commented at how good and refreshed my skin has been. Even looking in the mirror I can see the benefits and I feel and look almost ten years younger and that really is magic. This competition is now closed! Congratulations to Josh, James F, Penfoldray, James D and Rob – you each win a set of Lab Series skincare essentials! This entry was posted on Tuesday, November 19th, 2013 at 9:00 am and is filed under Competitions, Guest bloggers, Hints & Tips, Men, Tried & Tested. You can follow any responses to this entry through the RSS 2.0 feed. You can skip to the end and leave a response. Pinging is currently not allowed. My all time hero has to be Spartacus, A true hero, although ultimately tragic. All time fave film hero has to be John McLean! Rocky Balboa and safe to say he could do with some LAB Series to help with his rugged looks! John McClane (Bruce Willis) in the Die Hard movies. My all time favourite movie hero is Robert de Nero !!!!! LEGEND !!!! Patrick Bateman in American Psycho. Not much of a hero but more a loveable rogue. He also takes his skincare VERY seriously. Forrest Gump – he does it all! Darth Vader, with Lab Series he wouldn’t have had to wear the helmet ! Classy and legendary James Dean. Tom Hanks’ character in Philadelphia. A-amazing. General Maximus Decimus Meridius played by Russell Crowe – the ultimate Gladiator. The Legend that was John Wayne! James Bond – who else! Its got to be James Bond-especially Sean Connery as him. Harry Potter of course! Hero! It would have to be Clint Eastwood. Looks as good now as he did all those years ago! Snake Plissken (Kurt Russel) in Escape from New York/L.A. MY ALL TIME FILM HERO IS, TOM HANKS IN PHILADELPHIA, WHO MAKES SUCH A FIRM FOOT FORWARD FOR GAY POEPLE. Arnold Schwarzenegger in The Running Man! johnny depp,such a versatile actor. Denzel Washington is my favourite Movie hero. Three words ‘Man on Fire’. Enough said!! It has to be Batman for me – or more to the point, Christian Bale as Batman! My film hero Tim Robbins in Shawshank Redemption. Got to be Elwood Blues. Simply brilliant character. Has to be Harrison Ford in the Indiana Jones movies! It’s got to be Christian Bale as Batman!! Especially in Dark Knight Rises! Swoon! Roger Moore as James Bond – smooth as silk !!!!! Uma Thurman as the Bride in the Kill Bill films. Bruce Willis, obviously! There is no other action movie hero that can match him!!! martin blank, grosse point blank. It has to be Christian Bale’s Batman! Got to be Clint Eastwood – says it all really except that he didn’t say a great deal! Liam Neeson as Rob Roy! Spider Man. With the mask on he wouldn’t need to worry about skin care. Has to be Batman, no doubt. Alan Rickman . No one sneers better. Has to be James Bond. Bill Bailey (Its a Wonderful Life) or Mr Smith ( Mt Smith Goes To Washington) for me , OK I love Jimmy Stewart. Liam neeson in the Taken films, phwoar! It’s got to be Shrek! Totally adorable, with Sean Connery as James Bond coming a close second. Am I the only one who thinks The Dude from Big Lebowski is a great film hero? captian jack sparrow , unconventional hero but an entertaining one . Superman (Henry cavill) – i would fly off with him anytime! Caractacus Potts from Chitty Chitty Bang Bang – he made a car that could fly and float on water! terminator is my fav hero for all the films! especially best in terminator two! Arnold Schwarzenegger in Commando. My brother made me watch that film so many times and now I still love it!